Stadium of the Year 2017: Meet the Jury Award finalists! Architectural value: This category includes attractiveness, clarity and consistency of the architecture delivered, as well fitting in local context, both in terms of location and appealing to potential users. 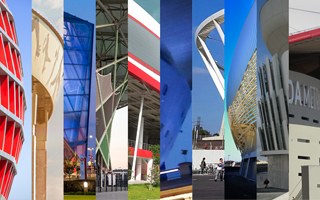 Architecture constitutes up to 40% of a stadium's score. Functionality: Fit for purpose? This category aim at evaluating whether access, sightlines, protection from elements and acoustics are solved properly, to the extent possible without site visits. Functionality constitutes up to 40% of a stadium's score. Innovation: The potential of becoming inspirational to other stadium investors/architects. It may be a set of features, structural or technological solution or even approach to specific challenges. Everything which may contribute to future stadium design can be taken as advantage of the stadium. Innovation constitutes up to 20% of a stadium's score. Jury Award announcement on March 7! Unless a tie-break is needed, the award winner will be announced on March 7. The announcement will take place online thrught our website and social media. Detailed schedule will be published on March 5. Also, keep in mind that there are two awards being granted. While the Jury has created a shortlist, in the Public Award all 27 candidates still have a chance to reach the title. In order to support your favourites, you can vote until mdnight on March 4 [CET] and share the information with others who might be interested.